FOCSSY specializes in building the most beautiful conversion oriented websites using WordPress, an open source software with extendable powerful features, trusted and used by 28% of the top websites worldwide. Our delivered product gives a high performance design that you can manage by using a powerful visual builder, so you can easily make changes on existing text and images without technical knowledge. Gorgeous web design that delivers superb results. Vectors and images of impeccable quality, chosen after extended research to complement your provided visual material, will be combined with our requisite image processing, so they will highlight your brand’s character in the eyes of your audience. Our credible web copy-editing of your written content and our high impact headlines, will make your brand’s message stand out and provide a fluid experience for your visitors. Clearly defined user paths with strategically positioned calls to action, give your website’s visitors an effective way to interact with your business. FOCSSY’s designs with simple and clean interfaces, optimized to load blazing fast, along with its properly organized content, will give you the business-client connection your brand craves, accompanied with the so much desired customer engagement. The way people are glued to their mobile devices makes it more critical than ever to be able to engage with them wherever they are. Our designs will look great on multiple screen and device sizes, without compromising the user’s experience. The more space a screen has, the more it might be able to show, but never at the expense of meaningful content or calls to action. We will properly configure all the SEO critical properties and aspects of your business’s website. This is going to give you the solid foundations and the Search Engine boost your business needs. Check the following list to see in more detail what’s included in all the packages FOCSSY offers, so you are on the right track to leverage your local web presence and be one step closer to regional dominance. Complete “Google My Business” listing configuration, including Google Maps presence, Phone, Open Hours, Photos, Insights and more, for a perfect business appearance in Google’s results with Knowledge Graph and a great local SEO boost with proper listing in Google’s Search Engine when people search for your business from the area it is located. Complete “Bing Places for Business” listing configuration, including Bing Maps presence, Phone, Open Hours, Photos, Insights and more, for a perfect business appearance in Bing’s results with Snapshot Pane and a great local SEO boost with proper listing in Bing’s Search Engine when people search for your business from the area it is located. Properly configured URL Structure, Title Tags, Meta Tags, Meta Description, Image Filenames and Image Alt Text are critical for top Search Engine results performance and FOCSSY delivers. Indexable content site-wide, ready to be shared and posted on your social media accounts. Consistent imagery and information build trust and brand recognition across networks. FOCSSY offers advanced social media profile configuration accross all major networks, so your brand reaps all the benefits of its social media presence. Think of Social Media as new channels for expanding your brand. Reach new people and new demographics with our professionally created and optimized profiles in the various social platforms. Studies have shown that companies that are active on social media, have a loyal fan following. This way your customers can reach you directly and your business can interact with them under a social friendly environment, by creating polls, ask them what its next product or service should be and more. Break the barriers of your brick and mortar store. When having a well configured Social Media Profile, you can reach more potential customers when someone shares your status on Twitter, when someone finds you in a Pinterest post or even when someone sees your freshly updated Facebook cover image. Those scenarios will bring them to your website where the conversion process begins. As stated already, the more people coming to your conversion-optimized website, then the more people see your quality products and services and the more are likely to buy, so your conversion rates are gonna be higher. It’s that instant feedback and comments on Google and Facebook reviews that can help you shape your brand and products for the better. That’s why you need to take advantage of this important asset. When your website is on all those social media platforms, gettings shared by different people, getting reposted and retweeted, your inbound traffic will be increased. Yes, you should pay for Facebook ads. But think about it. When your items start to get shared, that’s all viral. That’s not an actual Facebook ad cost. A well optimized social media profile increases the chances for your products, services or posts, going viral. Optimal SEO configuration is critical (that’s why FOCSSY offers it on all the packages). But ultimately, Google’s algorithm states that social media is a big part of high rankings as well. That’s why easy sharing capability connected with your domain is going to help you in search engine rank. Social media gives the ability of instant customer interaction. It’s amazing how small interactions like a product support reply, can really enhance customer’s purchase experience. When people love your brand or your product, the first place they are going to spread that love is their favorite Social Network. They are going to post a picture on Instagram wearing your product, or write about their experience on Facebook while tagging your Page. This is why it’s critical to be easily recognizable across all networks where your potential customers lurk. Be found from paid and organic channels and use audience data for goal-targeted actions. FOCSSY provides all the essential tools already configured for your audience analysis and laser-focused marketing moves. An excellent tool for monitoring the traffic, progress and performance of your website. It’s the king of softwares for strategic optimizations. It’s fully equipped with state of the art features that will provide you all the critical data to effectively pinpoint strengths and weaknesses of your marketing campaigns. Furthermore it can let you track from one place the productivity, social media engagement and ROI of you social media campaigns. You can also identify all kinds of activity inside your website, such as page views, user demographics, web store conversion rates, content performance, ad performance and a lot more! The most conversion oriented piece of code you can get your hands on. It’s implemented on your website and is connected to your Facebook ads in order to tell you which actions people take as a result of them. It can be used to record visitor actions (such as adding a product to their shopping cart, make a purchase etc) and then use this information to build Custom Audiences from your website and then effectively retarget those same visitors – with specific ads – later. It can show you how successful your ads are by reporting on Conversion Events, like sales or registrations, that take place on your website as a direct result of your ads. It provides the option to optimize for website conversions. This means that Facebook will automatically deliver your ads to people who are most likely to take action, so you can drive more conversions and spend your budget efficiently. It reports the number of conversions you get and the cost per conversion. If you know how much each conversion is worth to your business, you’ll have all the necessary pieces to calculate your Return on Investment (ROI). That means that you’ll know how much revenue you earned for each dollar spent and it can also help you compare your results with those from other advertising channels. Email Marketing drives better returns on investment and customer engagement than other marketing techniques, this is why it’s vital to have it implemented on your website. FOCSSY’s Email Opt-In forms are delivered connected with an email marketing platform (you don’t need to have one in advance) and provide a beautiful and high performing way of asking for your visitors emails. Then you will have the ultimate communication tool for a direct business-to-consumer or business-to-business interaction with them and use the power of email marketing to leverage your business’s conversions. That means you will be able to personalize your messages (automatically) by using their name when sending your campaigns, segment users based on interests or demographics, inform customers for excisting offers, track your sales better and more. They are a communication channel built into every mobile device sold today and allow apps to reach out to users with short (clickable) messages. They have gained a lot of popularity among online businesses and marketers over the last couple years because they present a unique way to capture your audience, increase return visitors, improve retention, increase user engagement, grow eCommerce sales exponentially and in most cases have shown drastically higher Click Through Rate compared to those of the typical newsletter signups. 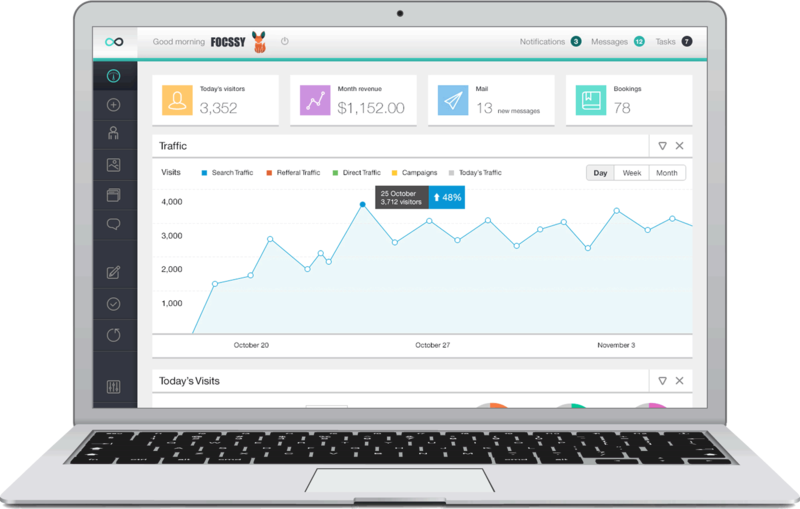 FOCSSY offers Push Notification implementation to your website, so you can automatically notify your visitors about new published content. You can also send them on demand by scheduling when and what to send them (limited time offers, events, important announcements etc). Those notifications can be delivered on a phone, or via a browser such as Chrome, Safari, or Firefox. The user can in return read and click the notification and get transferred to the URL of your choice. The best part is, they don’t have to be at your website the time the notification is sent. They only need to have subscibed at some time in the past. Also everything is trackable in real time and there is an option for A/B testing as well. Scalable, secure, isolated hosting environments with cutting-edge SSD drives for increased speed, optimized to support your website, e-Commerce and email needs. FOCSSY will help you choose the best scalable solution that fits your business needs. It offers a range of hosting solutions that all use NGINX technology to drastically increase WordPress speed. All plans support PHP7, HTTP/2 and come with a preinstalled SSL Certificate for enhanced security and fast loading pages, which in return increase brand credibility and conversions. The Email hosting is also powered by SPAM Experts®, for super effective spam prevention that gives you more time for the messages that matter to your business. Unmetered Data TransferFOCSSY provides you with unmetered data transfer for your website, so you can grow your business website freely, and attract more and more visitors. Unlimited Email AccountsYou can have unlimited number of FREE email accounts at your domain name - e.g. you@yourdomain.com. You can also use forwarders and aliases that allow you to forward emails received to any of your email accounts to another mailbox. FOCSSY's hosting plan includes the three most popular web-based mail clients: Horde, RoundCube and SquirrelMail, so you can access your email accounts from any computer with an Internet connection. Full cPanel AccesscPanel is the leading standard in webhosting software solutions. Although everything will be perfectly tuned in and optimally preconfigured for your website to run at maximum speed on delivery, you can request full cPanel Access anytime you want. SSD StorageFOCSSY stores all data and databases on cutting-edge Solid State Drives for a x20 increase in performance compared to regular hosting providers. Your customers will love browsing your website. HTTP/2 EnabledHTTP/2 is the newest version of the HTTP protocol and it allows browsers to load websites much faster. HTTP/2 is supported on FOCSSY's servers. This means that your visitors that use a HTTP/2 ready browser to visit your site will enjoy faster loading times which in return increases conversions and minimizes bounce rates. Several Layers of CachingFOCSSY's caching services increases the number of hits a site can handle and drastically boost loading speed. FOCSSY offers three levels of caching options to accelerate your site: Level 1: Static content cache; Level 2: Dynamic data cache, both powered by NGINX; and Level 3: Database queries results cache, running on Memcached. BASIC Caching includes level 1 only, while ADVANCED Caching includes all 3 levels. Power & Hardware RedundancyFOCSSY's hosting datacenters provide multiple failover options including power generators and enterprise-class UPS for a 99,99% uptime. Also in case of hardware problem, there are replacement parts and whole servers installed and ready to go to dramatically minimize downtime. Your website is in safe hands. Anti-Hack Systems & UpdatesThe Web Application Firewall of FOCSSY's servers is updated each year with hundreds of new rules to protect your WordPress website, by fixing massive vulnerabilities and providing a protective rule the same day it's discovered. The highest level of security is also ensured by regular server updates and custom patches at the server level. SPAM Experts® Email AntispamThe best and most advanced solution against Spam by SPAM Experts®. Email spam protection for both incoming and outgoing email messages, so you can focus on the thing that matters the most, your business. Free SSL CertificatesFOCSSY installs and preconfigures SSL certificates for all delivered websites and eshops at no aditional cost. It secures your website's connection with the visitor with the TLS protocol, your website loads faster using the HTTP/2 protocol which requires a TLS connection to work and therefore your brand's prestige is increased and the conversions go up. Fast & Trustworthy SupportFOCSSY is here to help you choose the best scalable managed hosting solution for your business, considering key factors such as traffic, geography, criticality and budget. I will also answer and solve every issue related to hosting that might arise. Fast & Trustworthy SupportFOCSSY is here to help you choose the best scalable hosting solution for your business, considering key factors such as traffic, geography, criticality and budget. I will also answer and solve every issue related to hosting that might arise. Ensure peace of mind by keeping your website secure, snappy and robust, while you stay competitive running the actual business. Websites aren’t a set and forget thing. New technologies emerge, software is constantly being updated for added functionality, to be faster and more secure. New vulnerabilities that need to be patched, are discovered every day as well. That means hacks happen all the time and can have disastrous effects on your server, website and the way it appears in search engines. Since your website is a crucial part of your business, it requires extra care to continue to perform as expected. This is why FOCSSY offers a professional monthly Security & Maintenance care plan for your website. Check its unique benefits in order to take an informed decision. *Only a limited number of Care Plans can be supported due to time restrictions, so reserve your spot before your website goes live. Your website’s software will be monitored and updated on a timely manner. That means the WordPress Core, the Theme and the Plugins that give its functionality. This increases security by patching vulnerabilities and strengthening against attacks, therefore reducing the risk of being hacked or compromised, while keeping your website running quick and smooth. A firewall will be installed and configured with the best possible settings for your website. The firewall is a valuable network security measure that places a set of rules on incoming and outgoing traffic in order to protect your website. There is no such thing as perfectly secure website. It’s all about hardening it, so in the inevitable case of attack, you will have one more strong security measure in place, to keep unwanted access away. Your website will also get scanned and monitored regularly for potential threats and malware. Your website is vulnerable to hackers, regular vulnerabilities, server crashes, natural disasters and even user error. That means that if something happened to it, you could lose time, money and reputation! This is why it’s essential to have a reliable backup plan in place. So you can ensure that in case something happens, your website is safe. Backups worth more than your entire website investment. FOCSSY schedules and takes (off-site) daily, weekly and/or monthly backups, depending on your website’s activity, so it can be restored safely to a clean state. Ready to lead your business to the digital landscape? Price tables are indicative because every business has different needs. We would love to listen and discuss about your project, so drop us a line. Your budget: €300 - €1500 €1500 - €2500 €2500 - €5000 €5000+ An estimation of your budget helps us identify the best approach to meet the needs for your project. Your realistic timeframe: 2 weeks 1 month 2 months 4 months 6 or more months Project completion requirements.